The Osprey Mutant 38 is a well featured climbing and mountaineering pack. At 38 litres and 1330g it may be too big and heavy to be considered a daysack by many. However the ability to remove lid and back panel (bivi pad and framesheet) allow it to be stripped down to a more reasonable quoted 950 grams (975g weighed). In contrast the extendable lid (with an attachable spindrift collar) provides an additional 10 litres (Size medium) taking the capacity up to 48 litres allowing the Mutant to be used for short expeditions. At 1330g the Osprey Mutant 38 offers a good compromise of features and durability for its weight. The main body fabric, Armourlite 420D, and the base fabric Armourguard 900D offer good levels of durability for the weight of the rucksack (i.e. there are better rucksacks for durability however at expense of overall weight, functionality or cost). The inclusion of haul loops shouldn’t lure you in to thinking that you could use the Mutant 38 for any serious duration hauling without significant damage to the bag. Think of them more as emergency use haul loops or on rock types and routes where abrasion isn’t a big issue. Like most rucksack fabrics the Armourlite 420D repels light rain but in any persistent rain it will quickly saturate. This is perhaps of little importance to many users who will use it primarily for dry weather rock climbing and winter climbing where snow can easily be brushed off. 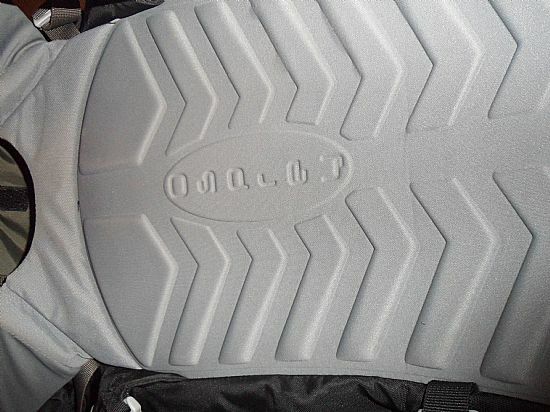 In the event of heavy rain there is a drain hole at the base of the back panel, however this exits from the bottom of the hydration sleeve not the main compartment (i.e. water must pass in to the hydration sleeve area first). The hydration sleeve itself is almost the full back panel and features a clip attachment point to hang your hydration bladder from with left and right exits for the hose. 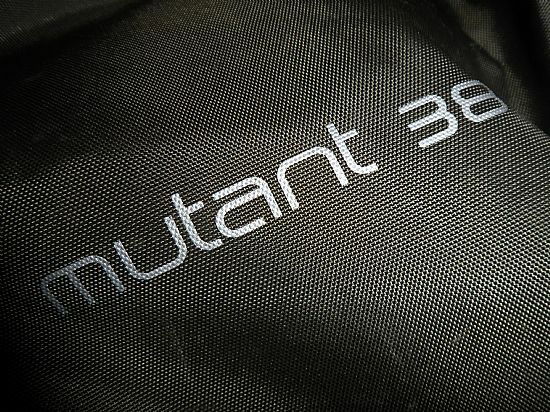 There is a raft of other great technical features on the Mutant 38; the “reverse wrap ergo-pull hipbelt” allows the hipbelt to be retained out of the way whilst climbing and the strap configuration allows good adjustment and distributes the weight well. 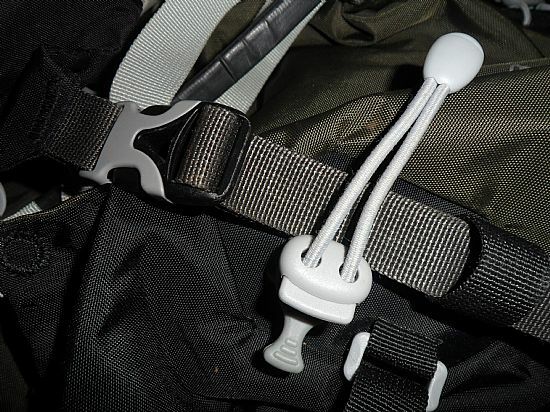 The hipbelt also features racking loops and an individual gear loop on each side providing good racking options (the original Osprey Mutant 38 was widely criticised for its racking loops). The ice axe attachment points are easy to use with gloves on and provide a secure attachment system. 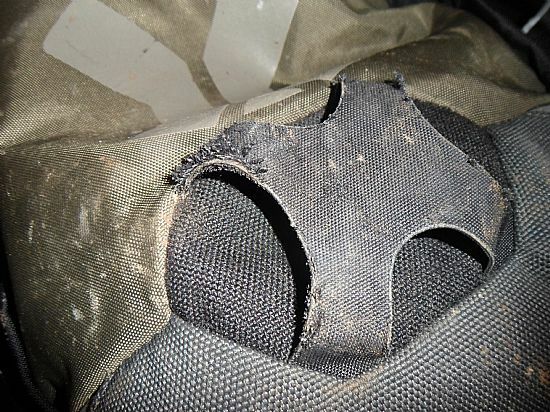 The gorilla grip patch (a coated area designed to improve abrasion resistance against ice axe picks) whilst a great idea in principal, has cracked and split on both Osprey Mutant 38 rucksacks I have had (the first one was replaced after the grab handle came loose). Osprey have often been criticised for having too many bells and whistles on their products (Too many features and extraneous straps have often been the hallmark of Osprey packs). The Mutant 38 does not buck this trend, however, it could certainly be argued that the bells and whistles on this rucksack more than justify their place. Almost every feature is a positive addition to the pack; this is a modern take on the classic stripped down alpine rucksack. Huge (10 litres) lid extension offers plenty of versatility. Extremely comfortable back system and strap configuration allow heavy loads to be carried in relative comfort. Two lid pockets, internal pocket and hydration sleeve allow plenty of storage/organisation options without impeding streamlining of pack (e.g. obtrusive side pockets). HDPE framesheet and bivi pad don’t provide a completely rigid back panel. Extraneous long straps need to be kept out of the way (in retaining straps on the shoulder straps, the tool-locks for the main compression straps, the hypalon rack loops for the waistbelt straps). Surprising amount of wear to spindrift collar where the drawcord runs through. The Osprey Mutant 38 is a stripped down alpine rucksack but with the addition of some sensible features which enhance the rucksack rather detract from it. 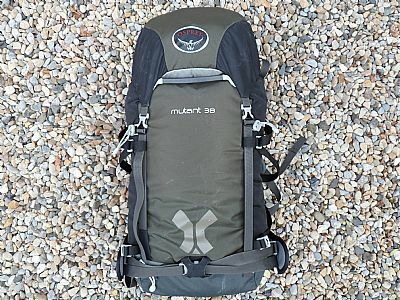 The Mutant may still be a little over featured and over engineered for the absolute elite but for most users it offers a great compromise of an alpine style rucksack whilst retaining some more luxurious features (Once you have tucked the extraneous straps out of the way).